With the sudden death of their father, the penniless Nicklebys are forced to leave the comfort of their Devonshire estate and seek refuge in London with a duplicitous relative. Ruthless businessman Ralph Nickleby loathes his relations on sight and grudgingly finds work for Nicholas at Dotheboys Hall, an appallingly abusive boys' school. Nicholas, who cannot bear to allow injustice to go unchallenged, confronts sadistic headmaster Wackford Squeers and sets in motion a rollicking series of adventures that lead to revelations of dark, closely guarded secrets. Originally serialized from 1838 to 1839, Charles Dickens' sprawling third novel ranks among the great comic achievements of the 19th century. The exuberant romp is populated by unforgettable characters, from the impetuous young hero, gentle Smike, and google-eyed clerk Newman Noggs to the lecherous Sir Mulberry Hawk and the spirited actors of Mr. Vincent Crummels' theatrical troupe. 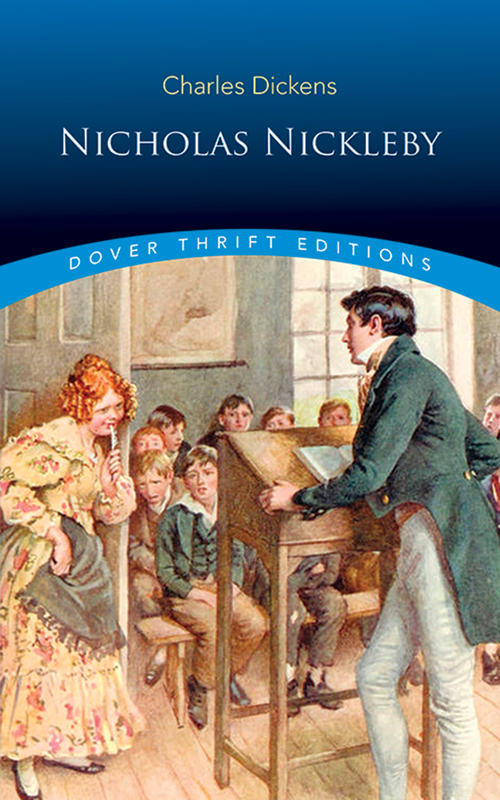 Frequently adapted for stage and screen, Nicholas Nickleby abounds in the ironic social satire for which its author is justly famed. Reprint of the Macmillan and Co., Limited, London, 1916 edition.